Tomorrow is the first day of the Year of the Pig, and to celebrate, here's an old favorite of ours. 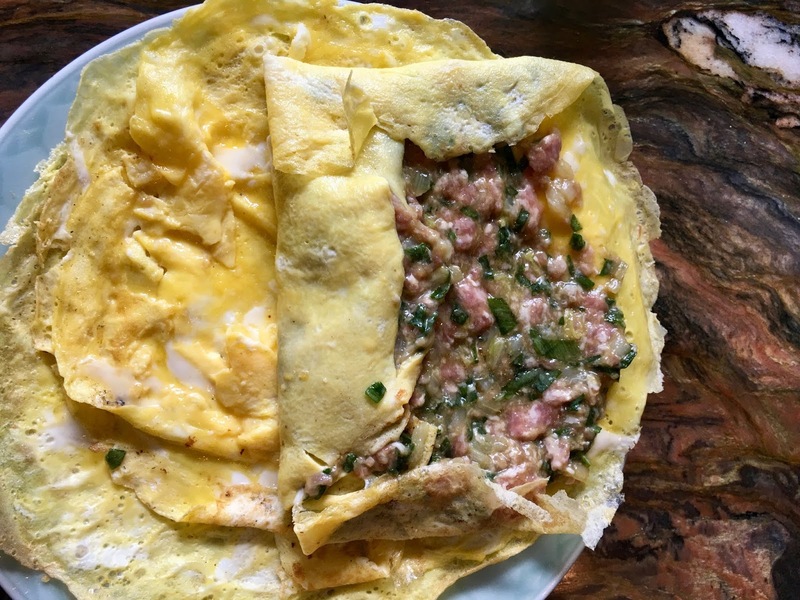 There’s nothing unusual about these omelet rolls, except for the fact that they are closest I've ever gotten to the porky nirvana I used to enjoy in a crappy little restaurant tucked into an alley next to the Taipei train station. That place is long gone, but I've been on the elusive trail of the right ingredients for the past 30-odd years. What was it that made those omelet rolls so mouth-watering? Well, to start with, the pork filling was so juicy that great care had to be taken whenever we attempted to bite into them, because serious dribbling usually ensued. The pork was seasoned so perfectly that my taste buds would almost stand up and march through the eggy wrapper in a frantic search for more of that well-seasoned ground pork. The pork itself probably came from what the Taiwanese call “black hair pigs,” the variety generally acknowledged to be of the highest quality and have the best flavor, much like what you get here from organic boutique ranchers. But Taiwan back then was an island jam-packed with pork aficionados, and pork was in just about every local dish. 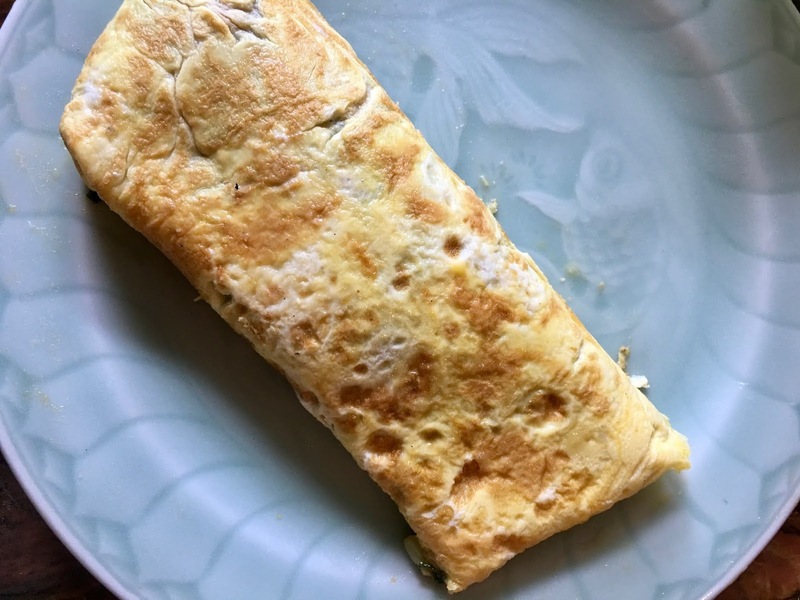 The thin omelet that wrapped up those long ground-pork logs were done with a deft hand and a good attention to heat and timing, because they were invariably supremely tender, yet able to stand up to being used as wrappers. I can’t fail to remember the mesmerizingly delicious poaching broth – that too was a serious piece of culinary art right there; what had started out as a simple broth had been enhanced by who knows how many days or weeks or years of stewing more and more omelets, their juices and seasonings seeping out and adding even more flavor to the broth. And finally, the omelet roll was always served with a good dribble of their insanely good sauce made of dark soy sauce, rock sugar, and other seasonings. That deeply caramel sauce was just sweet enough and just salty enough to gild this perfect lily. No wonder I was never able to forget it. My late father-in-law used to make small omelet purses for his New Year’s Eve banquets, and the fillings were a mixture of ground pork and fish. However, just in time for holiday cooking, these are more like the ones we came to love in that rattrap of a restaurant next to the train station. Be prepared, for this is serious home cooking. 1. This is best if you prepare it ahead of time so that the omelets can wallow in the sauce, but freshly made is good, too. Place the pork on a cutting board set on a wet washcloth. Smack the pork with the backs of two heavy knives, scraping the meat up and turning it over as needed, until the pork is light, fluffy, and sticky. Scrape the meat into a work bowl. 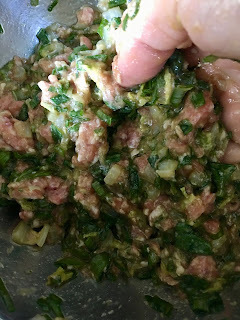 Use your hand to mix in the soy sauce and rice wine until they are fully absorbed, and then mix in the cabbage, scallions, and ginger, squishing any lumps of pork as you go. 2. Lightly beat the eggs until broken up and then whisk in the cornstarch. Set a wok over medium heat and swirl a teaspoon or so of oil around the bottom. 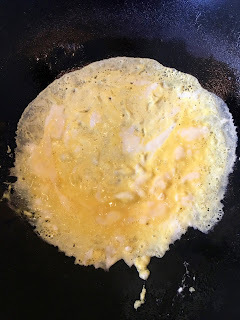 Add a third of the egg mixture into the wok and swirl the wok so that the egg spreads out into a wide omelet. 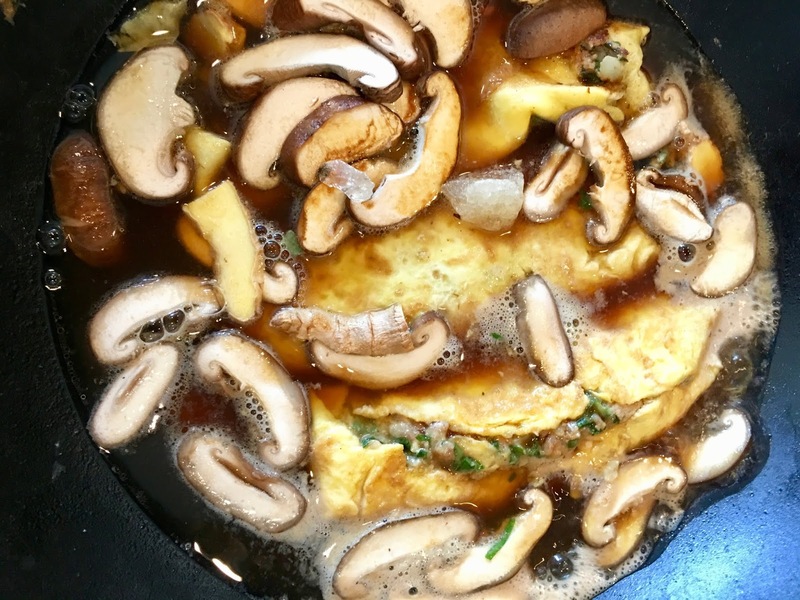 Fry only until the top of the omelet is no longer wet. Tip the omelet out onto a plate. Repeat two more times so that you end up with 3 omelets. 3. Remove the stems from the mushrooms and slice the caps. Place the sliced mushrooms, the mushroom soaking liquid, ginger slices, soy sauce, rice wine, and rock sugar in a wide pan and bring to a boil over high heat. Lower to a simmer. 4. While the sauce is simmering, make the filled omelets: Lay the omelets with the browned sides down on a work surface. Divide the filling in three and spread a third over each omelet. Roll each omelet up halfway, fold in the ends, and then continue to roll it up like a carpet. 5. Set the wok over medium heat. Add about a tablespoon of oil and swirl it around. Add one filled omelet with the fold side down and gently fry it on both sides to set its shape. Remove the omelet to the sauce and repeat with the other filled omelets. 6. Reduce the heat under the pan to low and simmer the omelets uncovered, being sure to gently turn the omelets over now and then. Taste the sauce after about 15 minutes and adjust the seasoning as desired. When the sauce has reduced to about ½ cup | 125 ml, remove the pan from the heat. Cut each omelet into attractive slices and arrange on a serving plate. Drizzle the tops of the omelets with the thickened sauce and sprinkle with the sliced scallion.